If Beale Street Could Talk, a viscerally lush film from Barry Jenkins, is a moving, searing story about young passion and the painful indifference of the justice system. Fonny (Stephan James) is wrongly imprisoned for a crime he didn’t commit. Tish (Kiki Layne) is pregnant with their unborn child, racing against time to help him prove his innocence. It’s a brilliant story about the endurance of true love, originally imagined by James Baldwin in the 70s. Michael Beach plays Fonny’s dad, Frank, determined to save his son from an unfortunate fate. Beach has starred in Patriot’s Day, Aquaman, Soul Food and numerous other roles. I caught up with him to talk about playing Frank and how technology helped him learn more about the novel’s author. What was your relationship with James Baldwin before Beale Street? I knew who he was and I had read Go Tell It On The Mountain a few decades ago. I hadn’t read Beale Street. To me, he was a historical figure, but I didn’t have any in-depth knowledge of him as much as I do now. What’s so great about today’s world is you can go on YouTube and see interviews that you were not privy to before this new technology. Now, it’s just amazing to see the talk shows and interviews that he had done and how ahead of his time that he was. I think I said that same thing to Barry about how Baldwin’s work and lesson remain as relevant today as they were back then. I know. It’s just so great. Okay, talk about meeting Barry for the first time and what he told you about Beale Street? The first time I met Barry in person was my first day on set. I wasn’t able to meet him prior because I was working out of town. I actually put a scene down for him while I was in Atlanta. I used my iPhone and sent a scene to my agent. It was some time before I heard back. They were interested, but they had to cast the lead. Kiki hadn’t been cast at that point. There was a lot of back and forth between representatives. So, the first time I met him was on my first day of shooting. We didn’t have time to discuss Frank or the script in general. Frank is a great example of someone who breaks down stereotypes in terms of an African-American father, a good dad. A good character. What was that like to play this role? What I loved about Frank is that I don’t know if he thinks he’s a good father. He’s working hard to change that because of the situation his son finds himself in. He was railroaded. 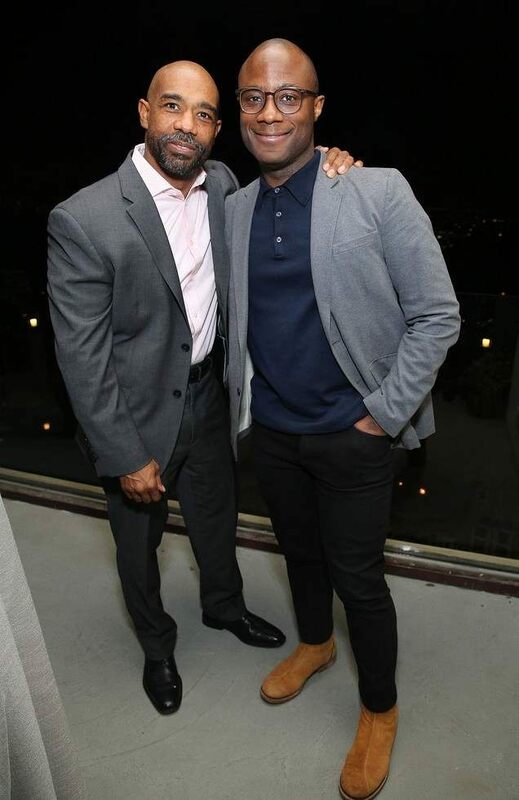 What I love about that film and the relationships, especially the one between Colman Domingo and I, is that we are these fathers fighting and willing to do whatever we have to do in order to help our children out of the situation that we know is wrong, that we know is unjust. They are preparing to start their own family. I love that aspect of the film from Frank’s point of view. With that, how did you approach Frank and give him that complexity and that man who wants to provide for his child? A lot of what I spent time on was on the family relationship and how broken it was. He touches on it in the bar scene. There’s also the big scene in the apartment. I thought about how off-kilter they are in terms of what they think about supporting their son. It seems to be at such odds with each other. The book has a few more scenes and you see that he does care for his daughters and that they care for, and respect their father. However, in the adaptation, there’s less to go off of. The fight for me was about how this was the time that the family should really be standing by Fonny and fight for him, as opposed to arguing about the reasons why he’s in the situation that he’s in. In the movie, it seems like the daughter’s and the wife are making justifications for why he’s behind bars for which he had nothing to do with. I love the differences between the two families. That was a great dynamic. What was it like working with Barry Jenkins, a director with such distinct visual style? The great thing about Barry is he knows what he wants. To me, he’s a young man. He’s in his mid-30s and I’m in my mid-50s. He knew what he wanted. He was easy on the set. He was so collaborative at the same time. If he saw something he really loved, he’d say, let’s go a little further in that direction. Or he’d say, “I don’t think Frank would sit like that.” You’d do the scene, come back and he’d say, “Thank you, man.” He’s so humble and so easy to work with that for me, it was a lot of fun and something I was excited about. You read the script and think you’re finally doing something of substance. I get it once in a while, you don’t get it a lot. My job is to make whatever I have work as best as I can. When you have something from another place and no one is thinking about dollars, obviously they want it to be successful, but the focus is on the material. Trying to pay as much attention to the material, the source, and what it was for, and how it relates to what’s going on in the world today. That’s a fantastic thing to be a part of. That family meeting scene was something. Ttalk about shooting that scene. For me, I was concerned because, not just in today’s world and all that’s going on with the empowerment of women and the different kinds of abuse that have been going on in this business, for me to strike another woman on camera, and particularly for some of my past work in Waiting to Exhale, Soul Food, and even in E.R, I was concerned about how that would play. Oddly enough, I haven’t heard anything concerning that for those particular reasons. I think people are really connecting to the horror of the scene. It’s a movie about love, trying to understand what’s going on, people have an understanding of what Frank is going through and where he comes from. What was said was so mean and disgusting. I felt that in the room. Aunjanue Ellis was just fantastic in that scene. The first part of the scene is more jovial and shows how much Frank and Joe have a great relationship. I think Frank and Joe get along, but you know prior to what’s coming, how they feel about the women in the family, and they knew it was going to be contentious. I don’t think anyone knew it would be as contentious as it did. I think that’s one of the more powerful scenes in the film. How do you choose your roles? From Soul Food to Beale Street and then Aquaman and your TV work? It’s a number of reasons. Sometimes it’s the role. Sometimes it’s the cast. Sometimes it’s the director or who’s involved. I just want to do a variety of things and sometimes it’s hard as a journeyman actor as I am. A lot of times you play very similar roles because that’s what they want to see you do. I’ve played a lot of good guys and bad guys. I’m always hoping I can do something beyond what I’ve done before. I just finished Superintelligence with Melissa McCarthy and Brian Tyree Henry is in it and most of my stuff is with him. So, I thought, “Wow.” It was a lot of fun. So, I choose based on a lot of those things. Sometimes, I fight to get on a project and I’m always more than willing to do that. It’s not foreign to me. I have no problem with being offered jobs because that’s fine too. [laughs].